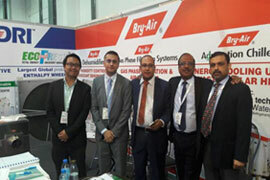 Bry-Air participated in The Big 5 event, which took place in Dubai from 21-24 November’ 2016. The event focused on the construction market . Through The Big 5 event, Bry-Air got the opportunity to network and showcase Bry-Air products to over 78000 visitors from construction industry coming from around 60 countries. DRI Executive Vice President, Mr. Varun Pahwa, along with Bry-Air (Asia) President, Mr. Dinesh Gupta networked with various visitors at the booth.